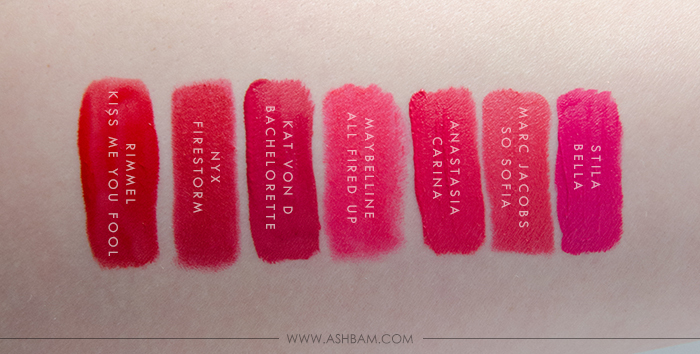 Anastasia Beverly Hills Liquid Lipstick – Carina – Described as an intense watermelon, this shade is a perfect blend of pink and red. The application was a bit streaky, but once it’s on your lips it’s staying there. There was very minimal transfer and I admit it was slightly drying and I even have a greater tolerance for matte lipsticks than a lot of people I know. I did have some flaking in the center of my lips & some feathering, but still somehow at the end of the day the color looked fantastic. It was actually a little tough to remove at the end of the night. Rimmel Provocalips 16 Hour Kiss Proof Lip Colour – Kiss Me You Fool – A warm toned red, which leans a little orange. Now this one certainly is kiss proof. You may or may not remember I tested out two shades from this range and this particular color did fantastic. 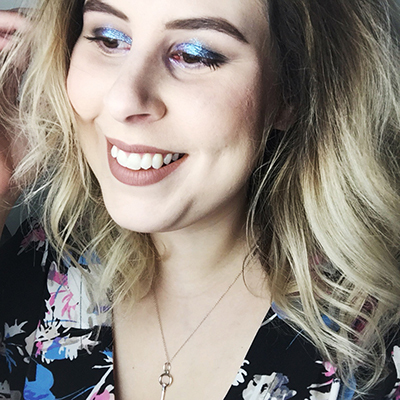 It’s super pigmented and very easy to apply, you just start out with the color and make sure you don’t let your lips touch for about 60 seconds to let it dry, then you apply the gloss! While I’m not the biggest fan of the gloss, it does help the lips feel more hydrated and the shine eventually fades. It’s a great option if you’re going to be spending all day in your lipstick and don’t have time for touch ups. 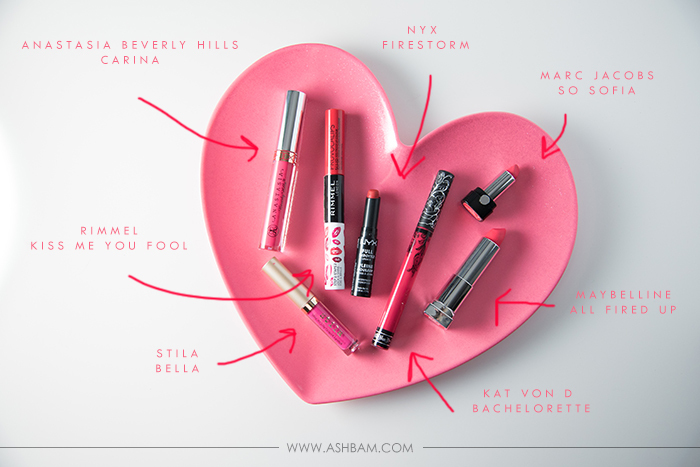 Stila Stay All Day Liquid Lipstick – Bella – A bright pink and clearly the most pink of all my favorites. I’ve only recently started wearing pink shades and this is such a gorgeous one. When applying this it’s best if you use a thin layer, I found that if I you try to do more than one it just moves the lipstick around. Luckily it’s extremely pigmented so you get full coverage in one swipe. I did have some transfer and flaking, but the color still looked really nice throughout the day. NYX Full Throttle Lipstick – Firestorm – A bright red with a slight magenta undertone and quite possibly my favorite out of the bunch. I’m in love with this formula. 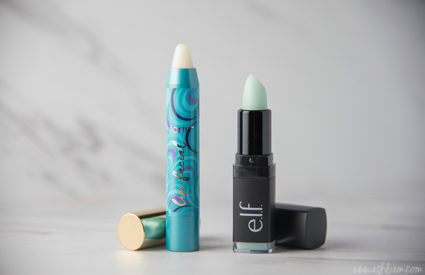 It’s a gorgeous matte and it feels great on the lips. I did end up eating oily food and it completely wore away, but I didn’t have any issues reapplying and after that it stayed nearly perfect for the rest of the day. So as with most lipsticks I would just avoid oils and this one will have great longevity. Kat Von D Everlasting Liquid Lipstick – Bachelorette – A dark reddish fuchsia and this one definitely leans a bit more red than pink. In my opinion since it does tend to look more red it’s easier to wear. The pigmentation is fantastic and it’s so easy to apply. It dries down really quickly and it does feel a bit drying. As for everlasting, it only faded in the center slightly but other than that it still looked beautiful at the end of the day. Marc Jacobs Le Marc Lip Crème Lipstick – So Sofia – This one is described as an electric watermelon and I think it’s a more fitting description than for Carina. I also featured this in a previous post. 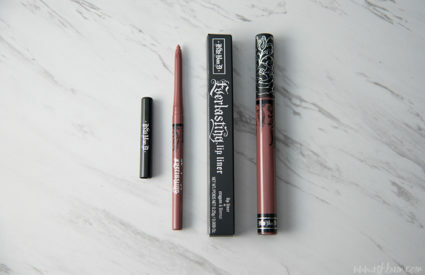 I was surprised by how much I liked these, they’re very creamy and pigmented. They’re not as matte as I usually go for, but they do a pretty good job sticking around. This shade in particular held up nicely, making it through lunch, but once it was around dinner time the color was pretty much gone. Maybelline Creamy Matte Lip Color – All Fired Up – A bright hot pink that once on the lips looks deeper and slightly more red. 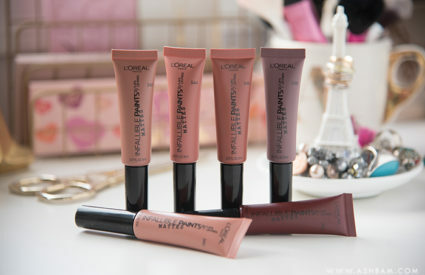 I absolutely love the creamy matte range, they’re so comfortable and just glide onto the lips. It does transfer some and I had a bit of feathering after lunch, but nothing terrible. After having dinner I was left with a stain the rest of the evening and for some reason it actually looked really great. 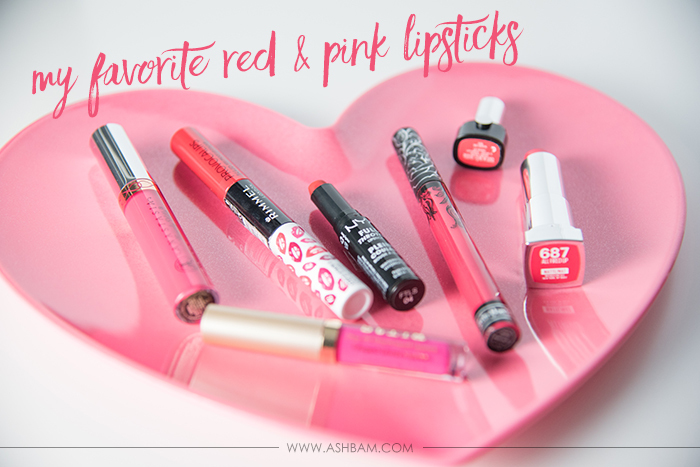 What’s your favorite red or pink lipstick? Also I wanted to let you guys know that on my Instagram The Lipstick Diaries I have a giveaway going on right now. 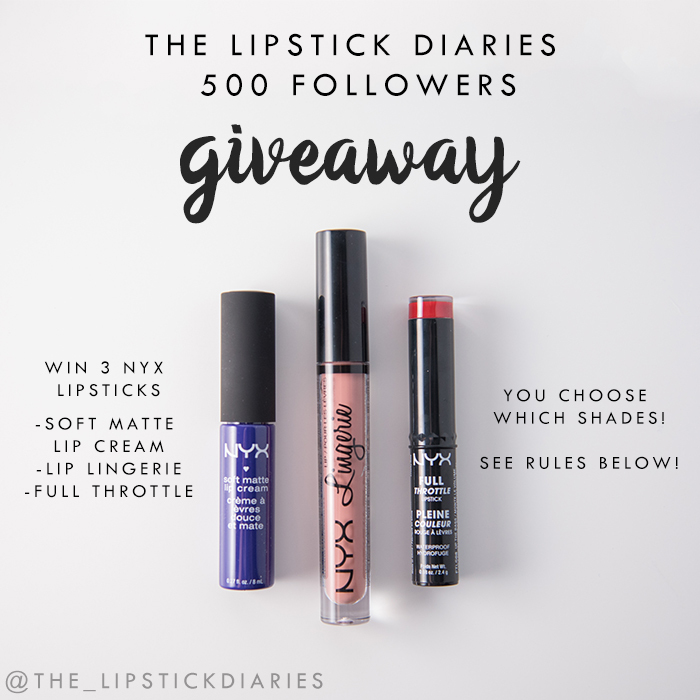 Head over to the post and you’ll get a chance to win three NYX lipsticks and you get to choose the shades!